COL DAVID P. MUZZEY DEAD. 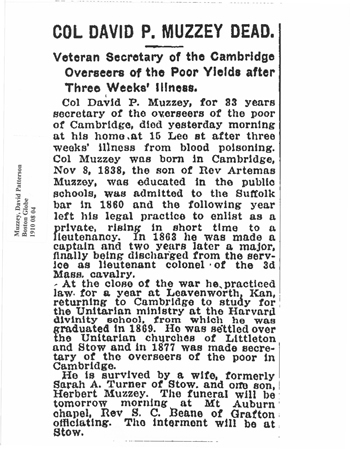 Col David P. Muzzey, for 33 years secretary of the overseers of the poor of Cambridge, died yesterday morning at his home, at 15 Lee st after three weeks’ illness from blood poisoning. Col Muzzey was born in Cambridge, Nov 8, 1838, the son of Rev. Artemas Muzzey, was educated in the public schools, was admitted to the Suffolk bar in 1860 and the following year left his legal practice to enlist as a private, rising in short time to a lieutenancy. In 1863 he was made a captain and two years later a major, finally being discharged from the service as lieutenant colonel of the 3d Mass cavalry. At the close of the war he practiced law for a year at Leavenworth, Kan, returning to Cambridge to study for the Unitarian ministry at the Harvard divinity school, from which he was graduated in 1869. He was settled over the Unitarian churches of Littleton and Stow and in 1877 was made secretary of the overseers of the poor in Cambridge. He is survived by a wife, formerly Sarah A. Turner of Stow, and one son, Herbert Muzzey. The funeral will be tomorrow morning at Mt Auburn chapel, Rev S.V. Beane of Grafton officiating. The interment will be at Stow.